This page shows photos from events where the whole group took part. Each section has photos under the link in the menu bar. Camping in the rain, oh joy! 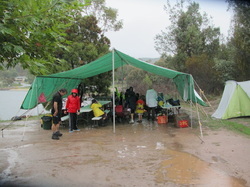 A hardy bunch braved cold wet weather, mud, streams running through the tent and general misery to have an alledged great time at Lake Lyell near Lithgow. The time is perhaps drawing close where our intrepid president may be banned from towing a trailer after blowing yet another tyre. More photos on the family camp 2014 page. Every Anzac Day we march with the Returned Service Men and Women from Brookvale and Mona Vale Bus Depots, Pittwater House Cadets and Marching Band. The march starts near Brookvale Public School and goes down Pittwater Road to the bus depot where there is a service and breakfast. Photos from Anzac Day are on the Anzac Day 2014, Anzac Day 2013, Anzac Day 2012, Anzac Day 2011 and Anzac Day 2010 pages. The Pub to Pub Fun Run starts at Dee Why and finishes at Newport. Each year we run the drinks station near Turrametta Beach. Photos are on the Pub to Pub 2013 page. After being washed out in June, we were greeted with a beautiful sunny day and very light breeze for our day at the Scout Air Activities Centre at Camden Airport. See more photos here. Horse riding was only one of several activities at the family camp held on a farm near Gloucester. 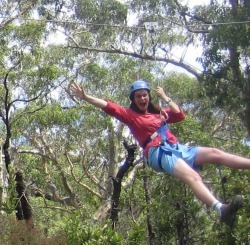 Others were bike riding, swimming and bush walking. You'll just have to trust us on those other ones until someone uploads some more photos! See more here. Rikki shows how it is done! Seven Cubs and three Leaders went to Cataract Scout Park by bus for the day to see what a Jamboree is like. They got to try some of the activities and received an award. Click here to read all about our day at the Jamboree! Photos too. On Saturday the 7th November Joeys, Cubs and Scouts, brothers and sisters, parents and friends, went to Camden to the NSW Scout Air Activities base, where we worked on our Flight badges, toured the airport and saw many amazing different planes. Most of us also chose to go on a flight on the four person Cessna Scout planes, piloted by Scout leaders. Did you use your fundraising money to pay for this outing? See a few photos of the day here. 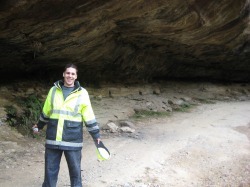 Rock likes to be safe! Over 50 Joeys, Cubs, Scouts and Leaders and families attended this year's Family Camp at Dunns Swamp. The rain didn't put anyone off, as we had loads of screened covered area. Uno and Poker were popular as was bushwalking, climbing the pagodas for breathtaking views, and canoeing and fishing as the weather cleared up. The swimming part of the program was an unfortunate side effect of canoeing with Teddy! There was a special trip into town for the those who can't miss the Grand Final. Dinner included a hearty beef casserole, and chicken stir fry and yummy pancakes for breakfast on the last day. Thanks heaps to Adrina for the superhuman effort, and also to the Putaansuus for the canoes and the fantastic shelter you shared with us all. On 19/09/09 on a moonless night the whole group went on a night visit to Sydney Observatory. We went to town by bus and then walked up to Observatory Hill. 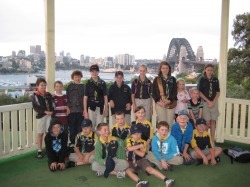 We had a picnic in the bandstand, that had wonderful views of the Harbour Bridge before the scouts taught the younger kids a new game. We met some Pathfinders that were also visiting the observatory. We saw the moons of Jupiter, the dual suns of Alpha Centauri and learnt about constellations in the planetarium and saw the Southern Cross and the Scorpion and Orion constellations in the sky. We learnt how to find due South by the stars. On 21st June 2009 we celebrated the official opening of our new Brookvale Scout Hall. See more photos here.